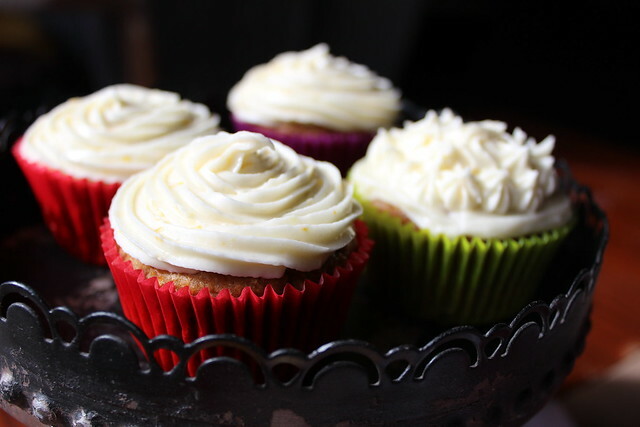 Cupcakes are individually sized portions of cake and are often made by creaming the butter & sugar. Muffins, also individually portioned, combine the wet ingredients with the dry ingredients. So by that definition, the SPCA Pupcakes I made should be muffins but Pupmuffins doesn’t have the same catchy name. 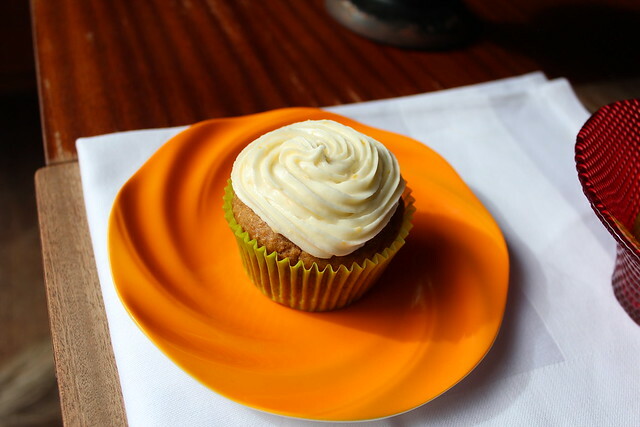 Not all cupcakes are created by creaming the butter & sugar. Cakes such as mud cakes melt the chocolate and butter together, so it follows that little mini mud-cupcakes also use that method. Other methods beat the oil, eggs & sugar before combing with the dry ingredients and any add-ins. These Lemon & Apple Cupcakes are technically muffins in the method I have used though once they have the frosting/icing added, they move back into the realm of cupcakes. 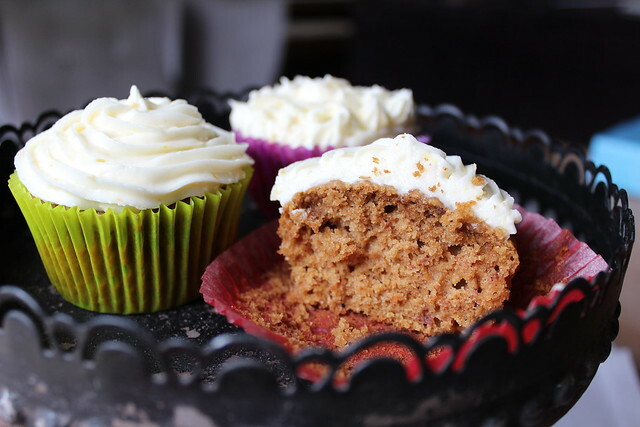 The texture of these cupcakes is half-way between a muffin & cupcake – not as coarse as muffins but not as fine as a regular cupcake either. The wholemeal flour does alter the texture a little but adds a nice nutty flavour. Anyhow, call them cupcakes or muffins, they still get eaten. 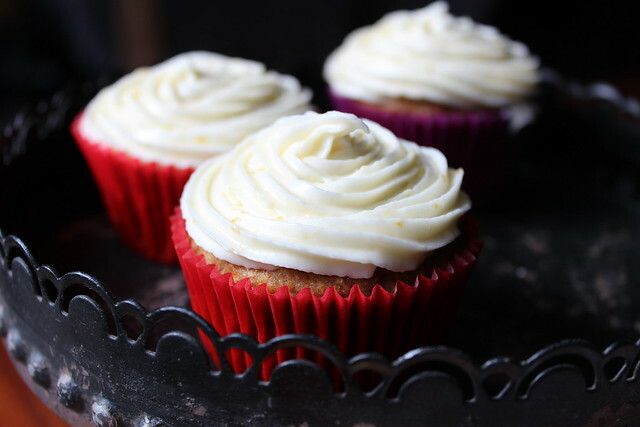 These cupcakes are quite moist so need to be eaten within a couple of days of baking. I usually double the batch and they still disappear very quick. Miss M is busy taking orders so she can sell these cupcakes on Friday to help raise funds for the SPCA. Preheat oven to 180ºC. Line 12 muffin tins with cupcake papers. Lightly beat eggs in a medium bowl then whisk in oil, lemon juice, vanilla extract, apple purée and lemon zest. Combine flour, sugar, baking soda and salt in another bowl and stir to combine. Combine the wet with the dry ingredients and mix until combined. Fill cupcake papers 3/4 full and bake for about 20 minutes, or until cooked. Place all the icing ingredients in a bowl and beat until smooth. Spread or pipe over cold cupcakes. This entry was posted in Baking, Cupcakes and tagged Apple Cupcakes, cupcakes, SPCA by Jo Dohrman. Bookmark the permalink.